Are you searching for a spray to take out the hornet's nest or the wasp den in your garden? Look no further! ...and the fact that it's still the most affordable option for what it delivers, despite out-performing the other big brands (like Raid). 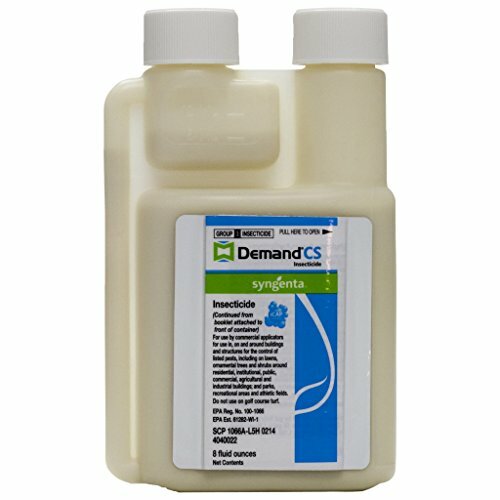 With an active ingredient of cypermethrin, this insecticide is strong enough to take out most wasps, hornets, yellow jackets, bees, ants, roaches, and even fleas and frogs! Just combine it with a sprayer like the Chapin 2-gallon and you should be good to go. 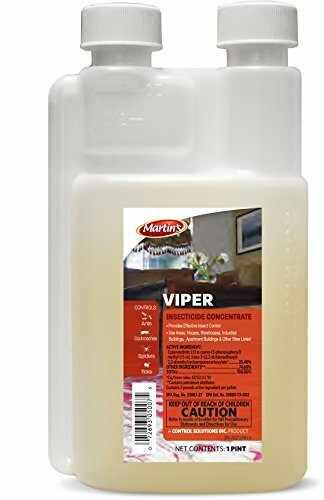 The manufacturers of Viper ensure up to three months of residual protection against new infestation after treating your home and surrounding areas, which delivers extra peace of mind when you're dealing with pest infestation. 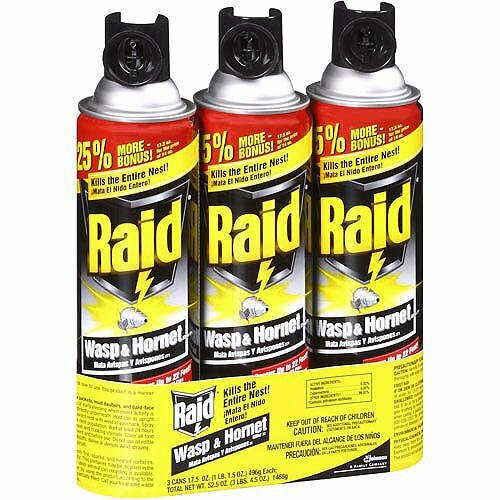 If you're looking for an easier more traditional "point and shoot" can of spray ready out of the box for your wasp/hornet problem, we do recommend Raid's product. It has a spray distance of 22 feet and will kill your wasps/hornets before they even hit the ground. It has a residual action that will keep killing returning wasp, which is extremely important to let this happen before killing the nest. We've gone into more detail below about other hornet and wasp killing sprays, as well as some more information about how to use the sprays to take out these pests for good. If you've got a few minutes, check it out! Want to skip all this research and just hire a decent exterminator for your hornet and wasp problem? Can I Spray From Afar? Is Wasp Spray Dangerous to Humans? Do I Need Any Separate Attachments? We get it--you don't want a hive of ferocious wasps headed straight for your face. You're going to want something you can spray from a safe distance to knock out the hornets and the wasps before they realize what's going on. Keep reading to find out what kinds of sprays are out there to take out the wasps you see flying around in the summertime. Most of the wasp sprays in use by professionals are concentrated forms of pyrethrin insecticides, which come from the chrysanthemum flowers and shock insects to death on contact. These insecticides aren't used specifically to eradicate wasps, but rather a variety of different ground and winged insects. Normally, these sprays are sold in a concentrated form that you mix yourself with water, then pour into a separate sprayer (we recommend something like this) and launch from a safe distance toward the pests in question (in this case, wasps and hornets). The US Environmental Protection Agency places stringent restrictions on insecticides and pesticides, and no product is ever placed on the market that can ever be harmful to humans if used correctly. That being said, if a product is misused or if accidents occur, exposure to the pyrethrins is a possibility. If this happens, please seek medical attention immediately. Many retail-grade wasp and hornet killing sprays are available as aerosol cans, which typically use tetramethrin as an active ingredient. Tetramethrin is another derivative of the pyrethrin family, so it falls into the same category as the commercial-grade pesticides used to exterminate different types of pests. Oftentimes, however, the spray nozzles are what pack the real punch, not the actual insecticides. While the chemicals certainly kill the pests, the spray nozzles on the aerosol cans are designed to shoot the chemicals with enough force to kill on contact. Another important aspect about the aerosol cans of wasp and hornet spray is that the insecticide can be shot from several feet away. The nozzle propels the jet stream forward with enough force so that you don't have to endanger yourself and walk within a few feet of a nest full of angry wasps. Read Also: What's the best way to deter wasps? Both commercial-grade wasp spray and aerosol cans with spray nozzles get the job done, and they each have their merits. A commercial-strength spray will always be more effective in terms of efficacy, but tend these sprays tend to be more expensive. The pre-mixed aerosol cans with an attached nozzle are the inverse: they're more readily available in the retail market and usually cost a little less, but with decreased potency. Okay, so you've decided you definitely want to spray your wasps and hornets away. But how much exposure is too much exposure? What if a spray nozzle bursts? Do you need a mask to breathe? Will It Singe My Skin? Okay, first question: unless you're taking a bath in the chemical solution, chances are that it probably won't burn your skin. What If I Inhale It? Say that you've just inhaled a big gulp of a pesticide. Your next move: get to fresh air as soon as possible. If you are wearing tight clothes, loosen your garments and make sure that nothing is constricting your breathing or hindering airflow. After that, if breathing problems persist, please contact Poison Control in your area and/or seek medical attention immediately. Will It Burn My Eyes? When you use a pesticide as directed, the fumes and the backsplash should steer clear of your face. If you're still concerned, though, and want to protect your eyes, there's no harm whatsoever in wearing safety goggles while you spray your yard. However, if you accidentally rub your eyes with your glove or your exposed hands, wash your eyes under the sink immediately. Be sure to create a gentle flow of water across your eye rather than placing your eye directly beneath the stream of water, as this could cause damage. If retail-grade wasp and hornet spray from an aerosol can comes into contact with your eyes, it will result in extreme pain. However, it's unlikely that permanent blindness will occur. Read Also: What's the best trap for wasps? Some wasp and hornet sprays have the nozzle attached right on the container. With these types of sprays, you simply shake the canister and you're good to go. Some others require a separate sprayer nozzle to spray the solution around your yard. We've listed the products in our detailed breakdown which require the extra equipment, and we recommend buying a universal spray nozzle like this one. Alternately, if you have tall trees, it may be a good idea to invest in a 30 foot wasp pole--a special extender pole designed to spray insecticide from 30 feet away. We recommend this option for a sturdy, reliable extender pole in order to get to the hard-to-reach spots in trees or out of your normal reach. Viper EC combines affordability, effectiveness, ease of use, and availability in one package, which is why we recommend it at the top of our list. The active ingredient present is cypermethrin, which dispels quickly to kill insects but causes no harm to humans in such small doses. The spray is sold as a mix-it-yourself type of solution and is recommended to be mixed at a rate of 1.3 oz to one gallon of water. Once you've mixed the spray, you'll need an extra attachment to actual spray the liquid. We recommend the Chapin 2-gallon sprayer, which can be used to spray just about any type of liquid. Raid has established itself as a household name is pest control by offering products that work, and this is no exception. The spray comes pre-mixed in an aerosol can with a nozzle capable of spraying up to 22 ft of distance avoiding a "spray and run" nightmare scenario. This is also the most cost-effective option, as the spray listed here comes in a pack of three aerosol cans, as opposed to the single cans posted in the listings above. Our runner-up goes to Syngenta Demand CS Insecticide, which uses a microencapsulation formula to effectively take down any hornets and wasps flying around. Microencapsulation means that the active ingredient is coated by a protective polymer that strengthens the pesticide and forms a protective barrier around the chemical agent. Once the chemical is sprayed, the polymer breaks down and can sometimes provide a timed, extended release of the active ingredient, increasing its killing power. So, why didn't we list this product as our overall top pick? It definitely works well, but the markup on price is just too substantial in our opinion. We want to include this product in our list because of its superior quality, but be warned: it is one of the pricier options out there. CRC has created a spray that works to saturate wasps and hornets in an insecticide which will take them out instantly, and the product works as marketed. The spray comes in an aerosol can and is meant to be used like a can of spray paint, but can be sprayed from a maximum of 15 feet away (in order to protect the user from a possible retaliation from angry hornets or wasps). The trigger strength on the spray nozzle reaches a strength of up to 47, 600 volts, and there is an extension tube attached which doubles as a locking mechanism. This spray won't damage plastic siding, connectors, or other insulation, and is recommended for those undertaking at-home pest control--whether you're a beginner or an old pro. 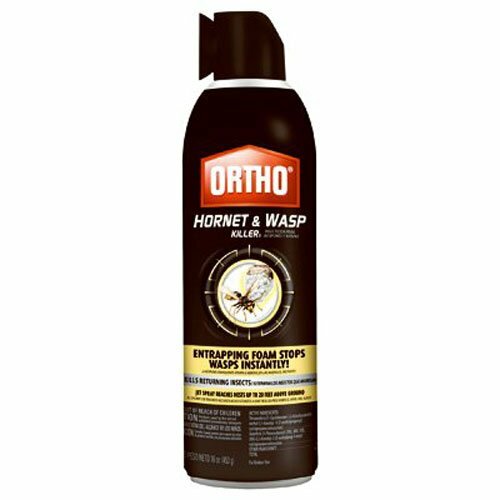 We like the Ortho brand spray because it combines the power of the CRC spray and takes it up a notch: by adding a foaming element, the insecticide is able to reach more crevices and kill more wasps and hornets. This spray is meant to be aimed directly at the nest, when found. The nozzle is directly attached to the can, like a spray paint can. The stream of insecticide can reach the targeted nest from 20 feet away, which gives the user adequately distance between the hornets/wasps. The jet stream sprays in one line with pinpoint accuracy, meaning that you'll more or less hit your target without a sticky mess. The hornets and wasps will drop dead immediately, and you'll just have to dispose of the nest. The bottom line is that no one wants a hornet or wasp nest in their yard, and no one wants to deal with these flying pests all season. Every product on our list is effective, but we rate Viper as our #1 overall recommendation for a few reasons. If you're looking for a more traditional "point and shoot" type spray, then we recommend Raid's wasp and hornet killer. With a 22 feet spray distance and a 24 hour residual to kill returning wasps and hornets, it should work well for most homeowners. Curious about other hornet and wasp related products? Check out our other detailed guides to help you deal with your pest problems.